“Your Sister’s Sister” opens with an unusual eulogy. Jack’s (Mark Duplass) brother Tom died one year earlier, and friends and family gather to honor him. But Jack isn’t satisfied with all of the kind words, as Tom was a jerk who acted kind to get ahead. And for that, Jack respects him. This is mainly what “Your Sister’s Sister” is: a lot of people talking about what they think is wrong about conventional wisdom. And if you can tell from this first scene that you won’t like this, then you can get out. In “Your Sister’s Sister,” the characters talk. And they talk. And then they talk some more. It is the very definition of Mumblecore. However, Mumblecore is a terrible name. The characters aren’t mumbling and bumbling about nothing, they are actually having deeply thought out, entirely realistic conversations. Duplass, in his second great performance of the summer (the other being “Safety Not Guaranteed,” also set in the Evergreen State), plays lovable jerk Jack. As goes the indie movie formula (in which all characters in any film are in some kind of rut), Jack is in a rut. He’s mentally unstable and not financially secure. Understanding his unease, his platonic best friend, Iris (Emily Blunt), suggests he ride his red bike out to her parents’ isolated vacation house and do some soul searching. But alone time isn’t going to work for him. When he shows up, Iris’s sister, Hannah (Rosemarie DeWitt) is already there. Naturally, Jack is a little too awkward to just ring the doorbell, and naturally Hannah is going to freak out about a random stranger looking at her through the window. According to common film knowledge, no platonic friendship between a man and a woman can exist without a little sexual tension. But we’ll get to that after Jack and Hannah drown their sorrows in a bottle of tequila. Hannah is a lesbian and just went through a bad breakup, but that doesn’t stop her from sleeping with Jack. Things get awkward when Iris shows up for a surprise visit. While watching “Your Sister’s Sister,” I wasn’t always sure if I was actually watching a film; more often, it felt like a play. Other times, it just felt like snippets of real life. Besides the opening and a few scenes in the woods, the whole story essentially takes place in one location. There couldn’t have been a more intimate, and often uncomfortable, way to get to know these characters. In such a short span of time, we learn more than we probably have any right to know. We learn about all of their insecurities, including Iris’s weakness for guys with skinny jeans, as well as her love for Jack. But if you were looking for something worse than that, Hannah is a vegan. As the film will show, anyone who is on a strict diet of dried up bananas needs to eat a dollop of butter every once in a while. “Your Sister’s Sister” director Lynn Shelton that also scripted the film, though the dialogue was mostly improvised. Shelton’s last film was the Sundance hit “Humpday.” That was another film about a platonic friendship gone too far. Shelton’s films stand out because she takes odd relationships and makes them normal. She lets the characters be honest and be themselves, and she does that by staying as far away from them as possible. 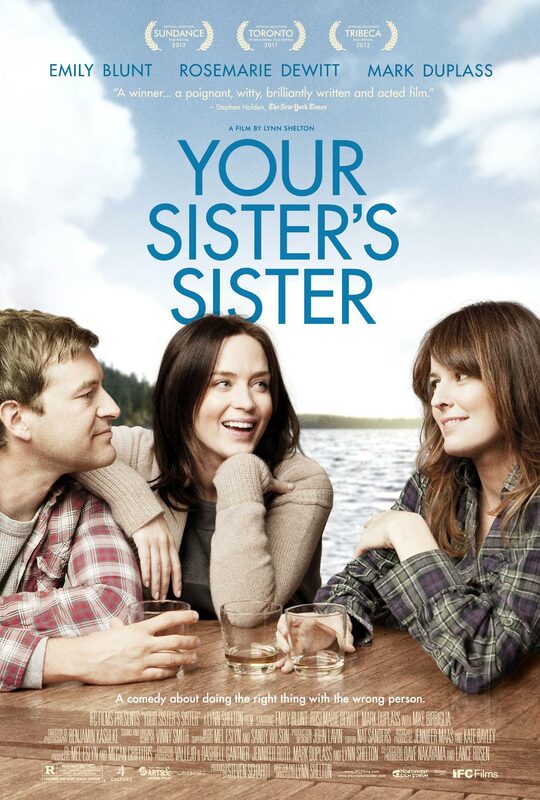 “Your Sister’s Sister” is 90 minutes of conversation, and it ends up being profound because it is so realistic. It never sounds like a bunch of actors reading off lines from a script, but rather like friends and family who have known each other far longer than we have known them. At times, Shelton takes on qualities of Woody Allen. There are many still, long takes, which last minutes at a time. If something is going well, then it will not be disturbed. Part of the watchability is also in part to the chemistry between the actors. Blunt is allowed to shine here and show subtle humor and a kindness in her demeanor even when some of her actions may seem selfish. DeWitt and Duplass (who I sometimes like more as an actor than a director) hit it off instantaneously because they both seem open and willing to do anything in their work. Each character has some sort of secret shared with another character, and all three of them serve as puzzle pieces in a web of unexposed truths. Even with all of the talking, “Your Sister’s Sister” is actually about something. “Your Sister’s Sister” is a funny film because Lynn Shelton is an effortlessly funny storyteller. However, she is never trying to be. The humor comes out at very small, very brief moments, and it all depends on how you can relate to it. In a scene in which Jack and Iris sleep in the same bed, they find each other waking up to the other’s feet in their face. I personally happen to find this idea very funny, and the fact that they eventually laugh it off and shrug it off is so perfectly in character for the two of them. I will not give anything away, because I very much hope you go to see this film, but all I will say is that it ends on a note that will intrigue some and anger many others. At first, I felt unsatisfied. But then, I realized it had to end that way. There is no way this story could end with any audience member feeling totally satisfied by knowing everything. 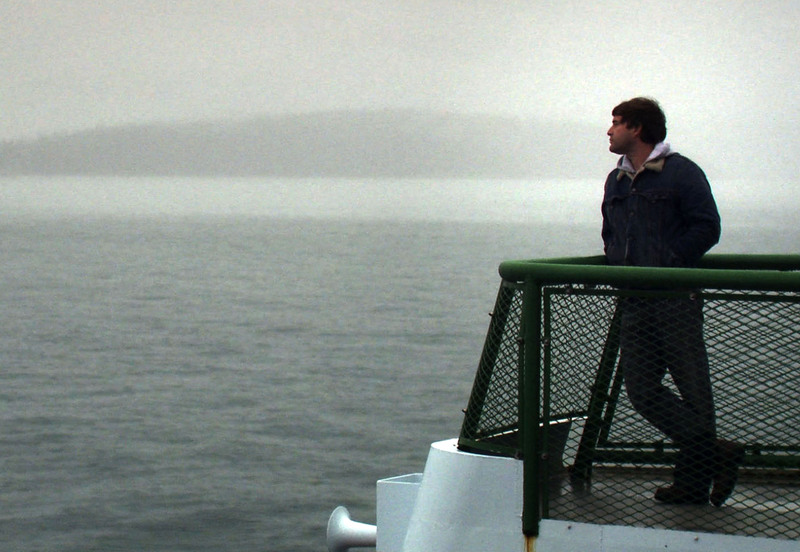 In an interview, Duplass, describing his approach to filmmaking, described his love of documentaries and that they often capture the best moments unintentionally and with the worst quality. He says he applies that to narrative films and in a way, Lynn Shelton puts that ideology to good use. In one way, the entire film is saying that there are certain details in life that are better left unknown. Therefore, the viewer too can remain partially in the dark. Even though the characters talk so much, they come to realize that there is still so much unsaid. As one of the more inventive love triangles I have seen, I could listen to the characters of “Your Sister’s Sister” talk all day. Don’t trust this poster, which makes it look like a bland Lifetime movie. 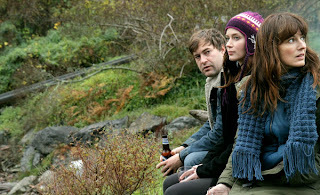 This entry was posted in Emily Blunt, Lynn Shelton, Mark Duplass, Movie Review, Mumblecore, Rosemarie DeWitt, Seattle, Your Sister's Sister on July 24, 2012 by ian0592. “The Dark Knight Rises” will elicit hours worth of conversation. However, it won’t be about the political subtext ripped from today’s headlines as you might have expected. It will consist of a lot more pondering about where Christopher Nolan went wrong, and how the finale of a masterful saga could be such a dissapointment. When Christopher Nolan first brought “Batman Begins” to the world, he was introducing a brand new Batman to a new generation of fans. Then, when “The Dark Knight” came out, he had made something unlike any action movie made before it. In “The Dark Knight Rises,” he tends to rely on all of the uninspired tropes that he was once so good at ignoring. The final installment of this Batman trilogy has a muddled plot that shines at certain points. It takes place six years after the death of Harvey “Two-Face” Dent (Aaron Eckhart) and the disappearance of the caped avenger, after Batman takes the fall for Dent’s death. Gotham is now in a time of peace. Deprived of his heroic identity, Bruce Wayne (Christian Bale) spends his days living in isolation in Wayne Manor. During this time, Wayne has become crippled as his family empire crumbles. He hosts parties that he doesn’t attend. He grows a beard and never comes out of his room. While people think that he has turned into Howard Hughes, Wayne actually manages to keep most of his sanity intact. It’s sad to say, but “The Dark Knight Rises” manages to share the same plot as “MacGruber”: a hero is shunned by society, goes into hiding, can’t get over the loss of his one true love, and is eventually called back into action because he is the only one who can defeat the latest threat to the world. Wayne has refused to move on with his life, which sends his loyal butler Alfred (Michael Caine) packing. What Alfred, as well as Christopher and Jonathan Nolan, neglect is the fact that Batman is Bruce Wayne’s true identity, and not the other way around. With The Joker and Two-Face out of the picture, the latest threat to Gotham is Bane (Tom Hardy), a psychopath in a mask that makes him look like a prawn from “District 9.” Bane, like a demon emerging from hell, was raised underground where he gained unmatchable strength and a dark view on humanity. Now, Bane raises an army of lower class warriors in the sewers of Gotham, as he prepares to wage war on Gotham’s wealthy, and restore power to the people. Bane is certainly a frightening looking villain. Too bad he couldn’t actually be one of the most frightening. Bane’s voice had to go through some altering in the editing room to make it more audible. However, his new voice sounds less like Darth Vader and more like Gandalf. A man preaching about the destruction of a city should not sound sagely. In addition to that, some damage is done by providing too much of Bane’s backstory. Besides Ledger’s performance, what made The Joker work so well is that so little was revealed about him. There is not enough mystery surrounding Bane. He should have been elusive, not wimpy. Hardy is a very talented actor (see “Lawless” when it opens in August), but this was not necessarily the best showcase for his talent, especially when all of his facial expressions are masked. 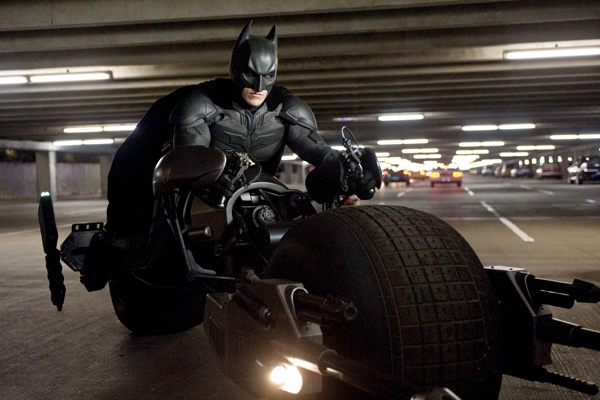 “The Dark Knight Rises” makes a fatal mistake by setting the stakes monumentally high. Among the many new things that it introduces is Miranda Tate (Marion Cotillard), the newest member of the board of Wayne Enterprises, who helps build a nuclear reactor below Gotham that will give the city clean energy. However, Bane turns it into a bomb, with the intent of blowing Gotham to smithereens. The class warfare powers the film at the beginning, and brings it eerily close to today’s headlines. However, adding in the total destruction of Gotham makes the conflict too big. Recall the two boats in “The Dark Knight.” Every time I watch it, I become deeply invested in which boat could blow up because it is a smaller conflict, and we get to know everybody involved. On a more positive note, there are a few new characters who add to the story. One of them is John Blake, a young cop played by Joseph Gordon-Levitt. It may be partly because Gordon-Levitt can do no wrong in my book. Also, he is an engaging new perspective on the battle for law and order in Gotham and in the end, one move he pulls off very much evokes Marshall Will Kane of “High Noon.” Also introduced is Selina Kyle, better known as Catwoman (Anne Hathaway). Catwoman is like a Robin Hood for Gotham’s needy. She is a stealthy thief who only meets her match when she first tries to mess with Bruce Wayne. While a failed “Catwoman” movie was made a few years back, Nolan’s Catwoman could merit her own spinoff. Unfortunately, like many of the great aspects first set up in “The Dark Knight Rises,” it is eventually ruined by the time the film’s nearly three hour run time comes to a close. Her moment of redemption felt contrived and out of place. Catwoman is constantly straddling the line between hero and villain, as she works mainly for herself as opposed to the greater good, so why not just make her a straight up anti-hero? The contrived fate of Catwoman pretty much sums up most of the other mistakes made by “The Dark Knight Rises.” I do not want to give away too much, so I will just say that there might as well have been Ewoks dancing around. As everyone expected, “The Dark Knight Rises” is visually striking, even if the action scenes are clunkier than those from its predecessor. It is also the cinematic equivalent of a lingerer: it spends too much time in places where it could have gotten itself out of much quicker. Bruce spends an awful lot of time trying to escape a hole in the ground. Montages were invented for a reason, and could have been put to good use here. BANE: So, you came back to die with the rest of your city? BATMAN: No…I came back to stop you. The real root of all of the problems of “The Dark Knight Rises” lies in the fact that it is a Batman movie that barely has any of Batman in it. The problem with the final installments of many trilogies is that they must struggle to rap up an entire story in a satisfying way. The ending of “The Dark Knight Rises” might have been satisfying in the past. However, because this trilogy redefined the way we look at superheroes, it just feels like it defeated itself. Side note on the location of Gotham City: In “Batman Begins” and “The Dark Knight,” Gotham was modeled almost entirely after Chicago. “The Dark Knight Rises” switches to New York. This makes some sense, as to evoke the tragedies of 9/11, as well as Occupy Wall Street, but it is so obviously a different city to the point of distraction. We know it’s not a made up place if the Brooklyn Bridge, Freedom Tower, and Empire State Building are all visible. Also, the Los Angeles skyline graces the backdrop of another shot. These are three very different cities. This entry was posted in Anne Hathaway, Bane, Batman, Christian Bale, Christopher Nolan, Joseph Gordon-Levitt, Marion Cotillard, Movie Review, The Dark Knight Rises, Tom Hardy on July 21, 2012 by ian0592. Emmy nominations came out this morning, and I’m celebrating them the same way I celebrate every awards ceremony: honoring those who didn’t get nominated! Yes, I understand at this point that these awards ceremonies are all politics, but it’s still fun to complain. Perhaps the snappy, pop culture reference-laced dialogue was too much for voters to handle. However, in its sophomore season, “Happy Endings” defied all expectations and became one of the funniest shows on television. While so many shows have tried so hard to rip off “Friends,” “Happy Endings” instead became a part of the post-sitcom wave. It is also the rare showin which there is an argument for any character being the funniest character on the show. Maybe next year will finally be The Year of Penny. A nod for Best Comedy seemed inevitable, and this snub is probably the most surprising one of all. While I still think that season three was best, wide consensus hailed season four of “Parks & Rec” the best in the series so far. And yes, it did hit so many high notes, both comically and emotionally. Season four took some big gambles, including leaving the parks department for some real world parody of the campaign trail. It is pretty incredible to see how far this show has come since its first season. What was once a spinoff of “The Office” has now taken on a life of its own, with the fictional town of Pawnee being just as funny a character as Ron Swanson and Tom Haverford have ever been. 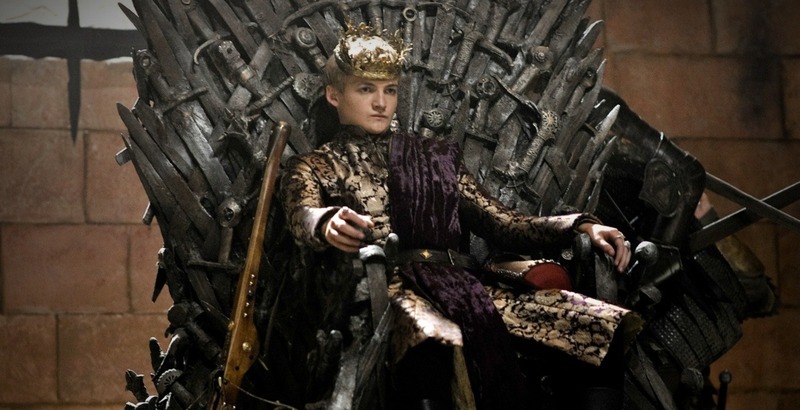 I think it can be agreed upon by all “Game of Thrones” fans that Joffrey Baratheon is the most hated character on this show, and perhaps on all of television and film. However, an actor must be this good to make a villain so clearly evil, yet so compelling to watch. Joffrey’s most memorable scene this season involved two prostitutes. It is as painful to watch as it is hard to erase from memory. Gleeson plays it completely straight, never offering an ounce of sympathy to him. Seeing him get slapped in the face felt all the more satisfying. No video of Joffrey could possibly be safe for work. Sometimes, when a comedy gives a standout side character more screen time, viewers come to realize that they were better in small doses. However, this is not the case for Jim Rash, who was worthy of carrying multiple episodes as the hilariously flamboyant Dean of Greendale Community College. In “Documentary Filmmaking: Redux,” he flawlessly channeled both Coppola and Brando. A psychotic director has never been this funny. He can also deliver every sexual innuendo he is given with more subtlety and cluelessness than irony. Sexual confusion hasn’t been this funny since Tobias Funke, but with his undying love for his dysfunctional community college, Rash secretly gives the show its heart. Yes, this list gets two members of the “Community” ensemble. Since the Emmys decided to devote almost an entire category to “Modern Family” actors, I’ll call it even. The “Community” writers have altered Jacobs’s Britta Perry more than any other character on the show since season one, and Jacobs has perfectly kept up with the change. In fact, in one episode this season, Jeff (Joel McHale) says, “you seemed a lot smarter when I first met you.” Britta is the well-intentioned political activist of the show who is constantly wrong about everything. 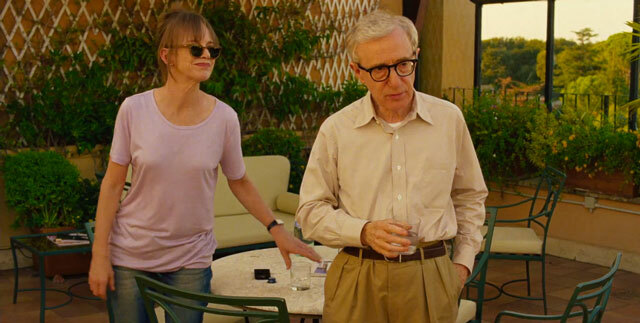 Jacobs is a great comedic actress because she seems willing to do just about anything, and she delivers every line she gets as if she is not thinking before she speaks. But for a truly great example of why she should have been nominated, look no further than “Pillows and Blankets,” one of the show’s top five episodes. In an episode that was supposed to be about Troy and Abed, she stole it with less than five minutes of screen time and not a single line of dialogue. Note: There is no point in mentioning the “Community” snub in the Best Comedy category. I would pretty much be re-iterating what I said last year. This entry was posted in Analog This, Breaking Bad, Community, Emmy Snubs, Emmys, Game of Thrones, Gillian Jacobs, Happy Endings, Parks and Recreation on July 19, 2012 by ian0592. Warning: Spoilers ahead! So if you don’t like spoilers (and based on the Internet buzz around “The Dark Knight Rises,” I can tell that people really don’t), read on with caution. It is fitting that the first episode of the final season of “Breaking Bad” would begin the same way that the pilot did. 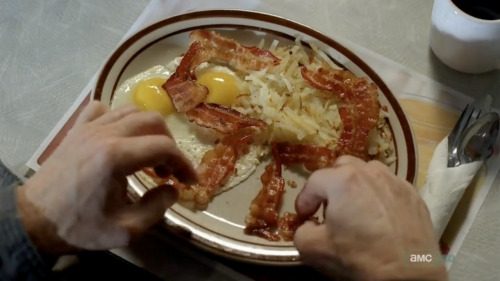 In the pilot, Walter White (Bryan Cranston) looks at the number 50 spelled out in his bacon. In the season five premiere, entitled “Live Free Or Die,” Walt was digging on swine and turning his bacon strips into the number 52. During this mysterious flash forward, Walt had aged two years and since that time, he has gone from caring, mild-mannered chemistry teacher to downright evil meth cooker Heisenberg. I may not be qualified to say that “Breaking Bad” is the best drama ever on television. After all, I still haven’t seen “The Wire,” and I’ve only seen “Sopranos” and “Six Feet Under” episodes here and there. However, I can say this: “Breaking Bad” is the best drama I have ever seen on television, and it shows no signs of slowing down. However, things are noticeably different. Now that Gus is gone, moral ambiguity doesn’t stand as strong. Walt is officially the show’s villain. He officially earned this title after breaking the one moral he had left by poisoning a child (to be fair, he also let Jesse’s girlfriend die in season two). Jesse, meanwhile, is somewhat starting to become the man Walt once was. He’s now just as good of a cook as he is, and he’s even getting into science. He comes up with ideas, such as that magnet one, right off the top of his head the way Walt used to be able to. Now, Walt’s ego is too high to let that brilliant brain of his actually work. But before I go further, I have to go back. Or should I say forward. No show since the glory days of “Lost” has used the concept of flashbacks and flash forwards as effectively as “Breaking Bad” does. Based on this flash forward, we now know that “Breaking Bad” takes place over a period of at least two years. 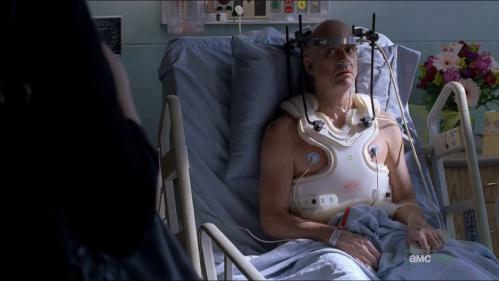 We also know that something bad enough will happen that will draw Walt to change his identity. I believe this is part of the last resort plan that Saul Goodman (Bob Odenkirk) told Walt about in the season three finale. Walt is now a man from New Hampshire. A close up of the state’s license plate focuses in on the state motto, “Live Free or Die.” This motto is basically the declaration of Walter White and eventually Heisenberg. This is a man who will do anything as long as it allows him to keep his freedom, even if that means constantly shifting his identity. This is a man who once gave up money for cancer treatment because he didn’t want charity. Walter White wasn’t always evil, but he has always been filled with the hubris that is leading to his downfall. “Live Free or Die” was essentially a heist film condensed into one hour. As far as heist films go, it was a very good one. This caper involved Jesse, Walt, and Mike (Jonathan Banks) trying to get a hold of a laptop found in Gus’s office containing hours of security footage. Even with Gus gone, his cold and ever watchful presence is always felt. It was locked up in a DEA evidence room and since they couldn’t get it from the inside, they instead got it from the outside using a giant magnet. Walt gets away safely, for now. Seeing as even the show’s own creator doesn’t feel sympathy for the character, I think Walt’s luck will eventually run out. Hank (Dean Norris) looked pretty sure of something we didn’t know while searching through the remnants of the meth lab. Did he already look at those security tapes and know who Heisenberg really is. Maybe he, like many have already proposed, switched out the laptop and has the real one in his possession. It’s a move that only Hank could pull off. The posters promoting the latest seasons touted the tagline, “All Hail the King.” This can now be seen as somewhat ironic, because despite all of his wealth, Walt isn’t quite on top of the world. It makes more sense to say that he thinks he is king. At one point in “Live Free or Die,” he claims he is right simply because “he says so” and later he tells Saul that “it’s not over until he says it’s over.” And there Walt is again, too stubborn to ever let someone try and tell him how to live his life. And as much as I liked this episode, it just felt a tad too short. This might have to do with the fact that this is the first time I’ve ever watched an episode of “Breaking Bad” live with commercials as opposed to streaming on Netflix. I am sure that I am not the only one who feels this way so next time Gilligan, don’t be afraid to go long. But as far as setting up the next two years goes, we have a hell of a lot to look forward to from the most intense drama on television. I feel as if every character on “Breaking Bad” is worthy of their own spin-off. Maybe with the exception of Marie (Betsy Brandt), just because I don’t think I can sit through another spoon stealing ordeal. And while I always thought the spin-off would go to Saul, I think Mike deserves his own at all. He kills it with his many deadpan zingers (“Keys scumbag. It’s the universal sign for keys”) and his mysterious way of living. Seriously, I actually want to see more of his friendship with those chickens. As always, leave it to “Breaking Bad” to screw with our expectations. 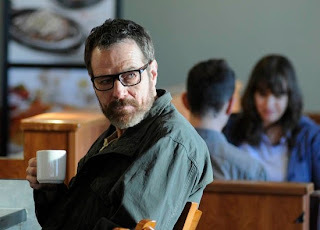 This entry was posted in Aaron Paul, AMC, Analog This, Breaking Bad, Bryan Cranston, Heisenberg, Live Free or Die, Vince Gilligan, Walter White on July 18, 2012 by ian0592. For a film about struggle after a hurricane, “Beasts of the Southern Wild” is surprisingly as life affirming as it is tragic. Then again, “Beasts of the Southern Wild” is the only film of its kind you’ll see that also has prehistoric creatures randomly roaming around. Hushpuppy, the six-year-old protagonist of “Beasts of the Southern Wild” is more curious than precocious. It’s nice for a change to see a young lead who’s willing to learn more about the world as opposed to simply thinking they know everything about it. As Hushpuppy, newcomer Quvenzhané Wallis is, as many before me have already said, a force of nature. Such a label is not an exaggeration. I will say this now so I don’t have to repeat myself later: Wallis is on her way to becoming one of the youngest actresses ever to be nominated for an Oscar. Hushpuppy grows up in that part of America that we often pretend doesn’t exist. The Bathtub, where Hushpuppy lives, looks like a slum in Mumbai. It is located in a part of Louisiana that is south of New Orleans. On one side of the levees lies a protected city made ugly by industry. On the other side lies The Bathtub, which is basically under water already. Hushpuppy and her father Wink (Dwight Henry) typically get around in a boat made out of a pickup truck. Bathtubians (is that what you would call them?) are a strong and resilient people who live off of whatever the land has to offer them, and make do even with the very little that they have. Indeed, they even learn how to fish without bait and tackle. Hushpuppy’s mother died when she was much younger, and she has only her father to raise her. Consequently, she raised somewhat like a boy, with Wink always asking her to suppress her tears and show her strength (one of the funniest scenes involves her shouting “I’M THE MAN!”). Yet, all the suppression of tears cannot stop Hushpuppy’s true emotions, and her quest to find her mother (or at least, the spirit of her) guides her journey. 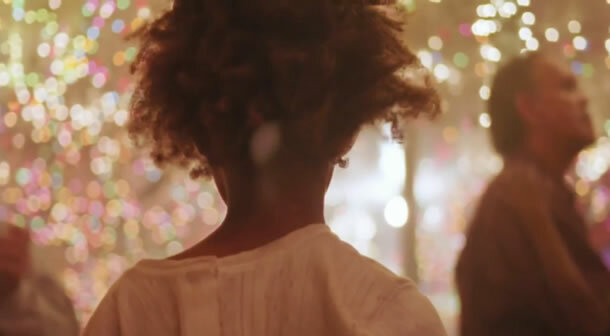 “Beasts of the Southern Wild” contains one of the most moving parent-child relationships a film has had in a long time. Of course when the hurricane strikes and gets stronger, Wink runs out into it to prove that he is stronger than it, as opposed to quelling his daughter’s fear. Walking in, I was expecting a tale of Magical Realism along the lines of “Pan’s Labyrinth.” However, “Beasts of the Southern Wild”is more about a young girl who has a lot to live for in her own life, but uses fantasy as a way to understand reality, as opposed to just escaping from it. This is just too harsh and demanding of a reality to simply escape from. After all, what can you do when a hurricane is coming and you’re stuck on the wrong side of the levees? Something that struck me most about The Bathtub is that despite the extreme poverty, it seems like an amazing place to grow up in. Because it is cut off from the outside world, Bathtubians form their own rituals and traditions to guide them. 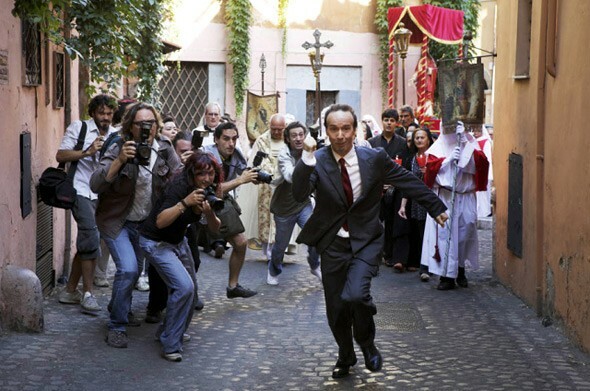 The film opens warmly on a festival, rather than on a disaster. The film, as mentioned previously, has a fantastical element to it. Early on, Hushpuppy learns in school that major environmental changes are coming, and that the only thing everyone can do is stick together. This is quite a tough lesson for a six-year-old to learn, it felt similar to when Max learned that one day the sun will burn out in “Where the Wild Things Are.” She also learns about the Aurochs, a giant creature that was once top of the animal kingdom during the ice age. Based on pictures I could find, the real Aurochs looked like cattle. The Aurochs that Hushpuppy sees looks more like pigs with horns. That’s fitting, as pigs are a common sight in The Bathtub. Hushpuppy’s fantasies don’t come totally out of her imagination, but rather as a kind of culmination of everything she sees. Hushpuppy is at too young of an age to be on a journey of maturity, but she is in the kind of environment where that kind of thing is forced to come about early. The Aurochs must symbolize her coming of age in some way I am still trying to figure out. That has been the part of the film has frustrated me and fascinated me most since I last saw it. I believe it fits in to Hushpuppy’s final words (which I am not spoiling, as they are in the trailer), that every piece of life is meant to fit together perfectly to create a whole of the gigantic universe. This might be known more commonly as the Butterfly Effect. If the Aurochs had never died, Hushpuppy could not have lived. The ultimate truth behind “Beasts of the Southern Wild” is that death gives way to life. That is a profound thing for a six-year-old to learn and to me, is sad, optimistic, and even beautiful. “Beasts of the Southern Wild” is the directorial debut of Benh Zeitlin. At such a young age, he is already a visionary with an exciting career ahead of him. At times, it feels like he doesn’t even want to direct a story, but rather explore the lush scenery of the surrounding world. There are some very strange choices made by the characters. For instance, Wink at one point refuses medical treatment. Yet, Zeitlin never passes judgement when so much could have been. He becomes a true fly-in-the-wall in this very foreign culture that is right here in America. I actually had the rare opportunity to meet Zeitlin while at Cannes. It was at the beach screening of “Jaws,” and I remember he remarked that “Jaws” was like his muse. I could see some of the influence rubbing off here. This is not a horror film, of course, but the scenes in which the locals talk with each other reminds me of the scene in “Jaws” in which the men discuss their scars. During conversations like this, it is as if both directors, usually very present, walked away for a few minutes, because they knew the magic going on between the actors could not be disturbed. For a director, knowing when to shut the f**k up is just as admirable a quality as knowing which angle to use at which moment. As the end credits began to role, the first thing I thought was that I could not wait until Zeitlin’s next film, whatever that may be and whenever it may come out. For a film that is only 91 minutes long, “Beasts of the Southern Wild” tells an expansive story. After screening at Sundance and Cannes, Zeitlin’s film immediately captured the hearts of all who viewed it. However, I don’t know if a second viewing is enough. Another venture into the “Southern Wild” would be helpful, just so I can delve into the brooding images a little longer, and get lost in Hushpuppy’s delicately delivered voiceover. This entry was posted in Aurochs, Beasts of the Southern Wild, Benh Zeitlin, Dwight Henry, Hurricane, Louisiana, Magical Realism, Movie Review, Quvenhané Wallis, Southern on July 17, 2012 by ian0592. After the disaster of “Spider-Man 3,” which all but destroyed the hero that made superheroes box office gold, the world wasn’t exactly craving more Spider-Man. “The Amazing Spider-Man” isn’t the superhero movie we needed, but we got it, and it’s actually a stellar installment of the myth of a man in red spandex. To compare “The Amazing Spider-Man” with Sam Raimi’s “Spider-Man” is to tiptoe on a tightrope, as saying that the new one is better than the old one would be potentially putting down something that I deeply cherish. “Spider-Man” was one of the first movies I watched multiple days in a row when it first arrived on DVD, and it spurred an interest in comic books that led me to a giant box full of them in the attic (benefits of having an older brother). But then again, what makes “The Amazing Spider-Man” work is its ability to build on and improve the flaws of its predecessors. “The Amazing Spider-Man” seems most similar to the fantastic, revisionist Ultimate Spider-Man graphic novels. However, “The Amazing Spider-Man” also takes on a life of its own. It starts at the very beginning, during one of the crucial moments of Peter Parker’s life. As a child, Parker’s father, a brilliant scientist with a controversial view on genetics, is under constant threat. In order to keep Peter safe, he is to go and live with his Uncle Ben (Martin Sheen) and Aunt Mae (Sally Field) in their working class Queens home. One thing remains constant throughout the evolution of the Spider-Man Story: poor Uncle Ben can never catch a break. Years later, and Peter is the nerd we always knew. Except this time, he’s more of brilliant punk than a plain old brainiac. Spotting a skateboard, square glasses, and an old jacket, he looks more like the new generations definition of cool kids as seen in “21 Jump Street” (hint: reduce, reuse, recycle). Andrew Garfield plays him with just the perfect amount of teenage awkwardness that is uncomfortable and funny all at once. Because of this, him and Emma Stone, who portrays Gwen Stacy, bounce off each other well as love interests. “The Amazing Spider-Man” is very slow to start. However, there is a lot of necessary world-building that goes on which does not pay off until later in the story. But really, the movie could have done without the scene in which Peter researches the mystery of his father’s death by searching on the Internet. Obviously, this is the way research is done nowadays. However, there is nothing interesting about watching someone typing words into a search engine, nor does it make someone look any smarter. The fact that “The Amazing Spider-Man” at all had me thinking about the nature of superheroes and comic books shows just how different of a superhero movie this is. It all stems from the creation of a “new” Spider-Man and Peter Parker. Putting a mask on is a way of being two different people at once, and then gaining the ability to do what you couldn’t without a mask on. The old Peter Parker is timid and clumsy, while the old Spider-Man will climb up the tallest of buildings without fear. Meanwhile, the new Peter Parker and Spider-Man are almost one in the same: they are both brilliant, sarcastic, and sometimes too proud and too much in need of getting even. As Peter Parker, he gladly shows off his new ability to jump by playing basketball and smashing the backboard. As Spider-Man, he spends a large chunk of time trying to track down Uncle Ben’s killer. In addition, Spider-Man is not just a superhero here. Rather, as Police Chief Stacy (Denis Leary) describes him), he is an outlaw, roaming the city with his own code of justice, while hiding behind a mask. When he swings through Manhattan alone on silk ropes, it now feels more like a cowboy walking off alone into the sunset. While the Spider-Man of the 2000s gained the ability to shoot webs from the spider bite, the Spider-Man of Stan Lee’s creation had to create the web blasters himself. This makes a big difference, as it reveals even more how smart Parker is. No more of that “Go web go!” stuff. Unfortunately, the movie forgets to include what happens when Spider-Man runs out of his webs, which was always one of the more interesting elements of the comics. Seeing Spider-Man fight bad guys without his webs is like seeing Samson without his hair. Only this Samson can jump much higher. Superheroes, in general, were created to pull of the physical feats that humans could not. The first villains of Captain America and Superman were Nazis. 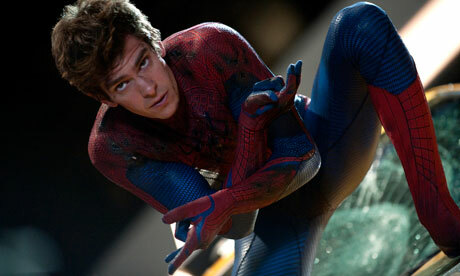 “The Amazing Spider-Man,” in a way, is about what makes a hero. Peter can be a hero with or without the mask. If superheroes are made to do what humans are incapable of, then the point of one armed Dr. Connors’ (Rhys Ifans) cloning experiment was to prove that humans on their own are weak, and only with the help of the genetics of others can they truly excel. Maybe this is foolish, as the experiment goes awry and turns Connors into an evil lizard monster (not as ludicrous as it sounds). Humans might not have the strength or ability to grow back dismembered body parts that other life forms have the ability to do. However, they do have the ability to distinguish right from wrong. I might be overanalyzing a bit here, but the fact that “The Amazing Spider-Man” at all put these thoughts into my head shows that this reboot runs deeper than one might imagine. It is in line with “Prometheus” as smartest blockbuster of the summer. The real difference between this Spider-Man and Spider-Mans past is character. By adding motivations to every action, the story no longer feels like a bunch of set pieces of a teenager having fun with his magical powers. “The Amazing Spider-Man” is far from perfect, but I truly appreciate its ability to take long stretches of time without blowing something up. The superhero movie has truly come a long way since its humble rebirth ten years ago. Sidenote: Don’t see this in 3D. This entry was posted in 3D, Andrew Garfield, Comic Books, Denis Leary, Emma Stone, Marc Webb, Martin Sheen, Movie Review, Sally Field, Spider-Man, The Amazing Spider-Man on July 7, 2012 by ian0592. “Roads? Where we’re going, we don’t need roads.” And so “Back to the Future” ends with the greatest sequel teasing line of all time. This sci-fi comedy from 1985 has only improved over the years into what people do not feel ashamed to label as a masterpiece. “Back to the Future” is a fine example of just how good American storytelling can be, and shows off our ability to create smart genre benders (Tarantino wasn’t the first one, apparently). It provides a great, finely detailed view of how this country changed from the 1950s to the 1980s, and we get to beat the Libyans. Plus, there are a few very good jabs that are still very relevant today. For example, the farmland being replaced with a shopping mall, and Marty McFly being mistaken for Calvin Klein because the brand name is written on his underwear. Great Scott, indeed. It’s got the name of our home and native land right in the title. “Once Upon a Time in America” is a time commitment, and you may not have enough time to see it all and have a barbecue all in one day. But sit through it at least once in your life, it is well worth the four and a half hours of your time that must be invested in it. I include it above many other American gangster movies, even those that I believe are superior, because this one challenges everything that feels right about a film. Through its span, it chronicles the rise and fall of criminals, and the rising and falling cycle of America. I guess it took an Italian director to best capture this idea. I talk about a lot of downers on this website, but “Rocky” deserves a spot on this list because it actually follows the basic premise of the American Dream: in America, if you work hard enough, you can become successful. However, it shows that success doesn’t always come in the form of winning, something that underdog stories tend to forget. Call it a lot of blind optimism, but “Rocky” still has the power to make you want to run up the steepest staircase you can find. This might be an odd choice. However, it follows the Fourth of July theme quite well. And what’s more American than Baseball? After all, it is our national past time. Baseball is to America what Cricket is to England: it’s a long, slow game with a lot of rules that don’t make a lot of sense, yet people still love it. That is why I’m happy that this childhood classic is more about a group of kids trying to get their ball back from a supposedly monstrous dog. There’s also a nice little Independence Day scene here, and a hilarious one involving chewing tobacco. Not to mention, Squints (Chauncey Leopardi) pulling the moves on a lifeguard by pretending to drown. This is a bold and admirable pickup line that no one should ever attempt to repeat. It’s hard to believe how overlooked this was when it first debuted in theaters. I think it was misunderstood as merely a gross-out picture, rather than the extremely sharp skewering of both bloated patriotism and apologetic liberalism that it is. It does so only in a way that “South Park” creators Matt Stone and Trey Parker could, by going as far as possible and making no stops along the way. 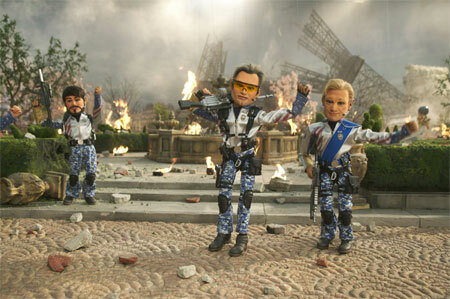 “Team America” has only gotten better with time. It is the perfect American satire, but it is also at its best when it is sending up the entire movie formula itself. Everyone remembers “America F**k Yeah” from its soundtrack, but the tracks “Montage” as well as “The End of an Act,” which questions why “Pearl Harbor” was made, show that you can draw in seemingly irrelevant pop culture references without distracting from the story at hand. This entry was posted in America, Back to the Future, Fourth of July, Independence Day, Once Upon a Time in America, Rocky, Team America, The Sandlot, Top 5 on July 4, 2012 by ian0592.